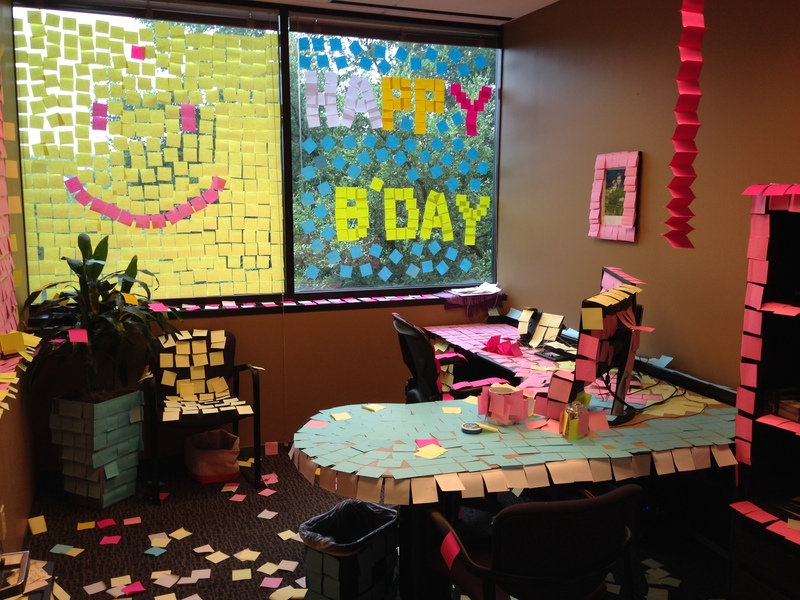 At MGAM, developers “decorated” the boss’s office for his birthday. Truly a fun place! The summer after I interned at Calxeda, I worked as an intern at Multimedia Games (a.k.a. MGAM). Since I wanted to be a game programmer during high school, this was my chance to see what the industry was like. For instance, video game companies are stereotyped as having tons of work for little pay. Would MGAM be like that? What do I mean by this? Imagine you’re a stock trader. Would you rather bet all your money on a single company, or spread your resources among a large number of stocks? If Multimedia Games had a hundred dollars to buy stocks, they would put one dollar on a hundred different companies. Instead of developing one massive game each year, they create dozens of small titles. I think this behavior makes them incredibly robust. When other game companies invest heavily in one massive game, they become fragile. If their single project gets delayed, the entire company is at risk. At Multimedia Games, no single title makes up a huge portion of the company’s revenue. Furthermore, by producing a variety of games, they have more opportunities to produce a hit. This also means there’s no ramp-up in workloads just before the game is released. No deadline is critical. Yes, there is a small increase at MGAM near individual milestones, but the whole company is not working past midnight to finalize the monolithic project. Only one team out of many needs to stay late, and its rarely as much as a 60-hour workweek. During my time at Multimedia Games, I had fun, made new friends, and learned a ton. They truly have a friendly, casual atmosphere. But by the end of the internship, I knew game development wasn’t for me. The next year, I interviewed with a variety of companies, and chose to intern at a technology consulting firm. Additionally, I attended 3-Day Startup and became involved with the Austin startup community. Have you developed video games or worked at a video game company? What did you think? This entry was posted in Software and tagged antifragility, Austin, internship, job, Multimedia Games, video games. Bookmark the permalink.